Welcome to my October Frugal Fashionista Fashion Show. If you’re not familiar with my ongoing Frugal Fashionista series, it’s my personal attempt to encourage women that we can dress fabulously, express a creative side that we never thought imaginable, and do it all on a “yard sale” budget. Yes, I have heard all the hesitations about dressing thrift, but I can guarantee that with an eagle eye and some patience, we can all create a small designer wardrobe consisting of core wardrobe pieces for $100. For those of you with petite to plus sizes, it requires a bit more work, but just this week alone I found the cutest size zero Anne Taylor dress (sold in their retail stores just last year), the sassiest size 22 pair of jeans…hip as can be, a fabulous size 20 black dress and three plus size skirts all for a total of $15. So have some fun…you may hit the jackpot your first time out…or not, but when you do, it’s SO worth it. My great find this week. I accented the outfit with a brown jeweled bracelet – $1 (yard sale), and a fun drop necklace that you must see, but can’t…ugh. Again, yard sale. So have you done the math? I was going to do another outfit, but this is your opportunity to show us the great deals and steals that you have put together in the fashion department. Remember, at least one of the main items in your outfit should be second hand. You are truly a Frugal Fashionista! I love the outifts you put together. WOWZERS! I love the skirt! Beautiful! You’ve really opened my eyes to giving the clothing in thrift stores more than a passing glance. I’m already styling a few more items to my work wardrobe thanks to you. Keep the ideas and tips coming. Thanks for hosting Jen! It takes a brave woman to post pics of herself, and you do it often! And I LOVE that skirt, it’s just wonderful. It’s great to find a piece that goes with lots of others. Although I find plenty of clothing for me and family, I am still working on finding shoes and accessories the way you do – or maybe it’s just that I don’t look because I tend to wear the same black shoes, brown shoes and three necklaces that are my favorites! I know…I feel so silly every time I take and post these pics with my outfits, but when I stopped posting the Frugal Fashionista posts, there was anarchy. I got a TON of emails, so it’s back to me putting me big ‘ole face on the screen. Trust me, I am looking for a mannequin or dress form at GoodWill. That would help. It wouldn’t be the same on a mannequin! But I hear what you’re saying about feeling silly. 🙂 Thanks for doing it anyway. Gorgeous – love the outfit and price! Hello, my frugal friend! Great outfit, love the skirt & you know how excited I get about all of this too. I’m so glad I came across your post. I love being frugal and finding great clothes. Thanks for posting your great finds. You look fabulous, as always. Love the shirt and the skirt…. I am so bad about taking pics of my finds lately but I have been in dire need of a fall jacket and scouted one out at Target that I loved 2 months ago. It is navy blue, peacoat style in a lighter weight fabric with big ole cream colored buttons. A fabulously fun green and cream polka dot lining. $40. Ugh. Last week it appeared, new with tags, on the rack at my Goodwill. $9.99 And it was 50% off day. My dream jacket for just under 5 bucks! I think it looks great in blog life too! I love the skirt! So cute! You inspired me to try thrift shopping, and your kind tutorial inspired me to try linking up again! If I did it wrong, it’s not your fault! (If you have a chance to read my link, you’ll understand why I almost didn’t post. :} ) Your finds are fabulous, as always. Jen, I just love your Frugal Fashionista posts. 🙂 Once again, you’ve proven that you don’t have to spend $$ to look cute! Awesome! Truly inspiring! Thanks so much, however, my question is – how did you lose the weight, because I could stand to lose some, too! My fifth child will be 2 in January! She is our precious gift from God. I know exactly what you mean because it is more than eating right and exercising for me. It has more to do with not wanting to taking care of me. I still look at it as being selfish if I ask for help, but it is a work in progress! Love your thoughts and ideas! Thanks again! That outfit looks great! Love the shoes. Great outfit! It would look great with chunky silver and turquiose southwestern type jewelry,too. I’m so happy to see the photos. It turns out my filter was blocking photo bucket! The outfit is fabulous! I just don’t get it though. How do you do garage sales? Do you just drive around looking for them or do you have a neighborhood that you stick to or do you look in the paper for ads and map out your plan? I NEVER find anything at garage sales and I hate just meandering until I find one. There has to be a better way that I am just missing. The thrift shops around here are just packed…with people! It seems everyone is thrifting nowadays and there’s nothing good left. Maybe it’s just the area in which I live – too much unemployment here. hi Barb – Sprinkled through out my trash to treasure posts I give tips for yard sale-ing, but I will do a few posts that give them all in one spot. There is a “plan” that you have to have to find the treasures…most importantly, getting up early and being at the sales by 7:00am for the best variety, going fast..don’t meander at each and every sale, mapping it out before hand so you know where you’re going and not having to look for them. It’s a hunt, but it’s a fun hunt. I only do church, school or neighborhood sales and going near the end of the morning people are practically giving away their stuff. For example, this morning I got Ann Taylor, Express, Gap and New York and Co clothes for .50 cents a piece. I also picked up some wooden toys for my boys (a wooden train for $1 and a wooden castle building block set for $3). I thought they’d be fun to put away for Christmas. I googled the names (I’d never heard of them before) and the train is valued at $75 and the castle at $280!! There are TONS of great deals to be had – and at homes you don’t expect it at!! But there’s also a lot of over priced things to wade through too. A lady this morning was trying to sell curtains for $150 – at a YARD SALE!! Chuckling with you on the $150 – WHAT IN THE WORLD? ?…I hit a few like that last weekend and thought to myself, “Do they think this is Target?” In my yard sale post that I did earlier this year, I completely agreed with you that there are still great things later in the day. In fact, by then, people are ready to really make some deals. If people are looking for really nice household decor, furniture and big tag items though, the earlier the better (since I will have beat you to them by ten…ha ha ;). Oh, I’m so glad this is a linky thing because I would love to show off what I am wearing in the frugal fashionista way! Okay, girlfriend, you are the BEST! I have a number of clothing items that I’ve purchased from thrift stores over the years, but you are THE BEST at pulling different elements together to make super-chic ensembles. 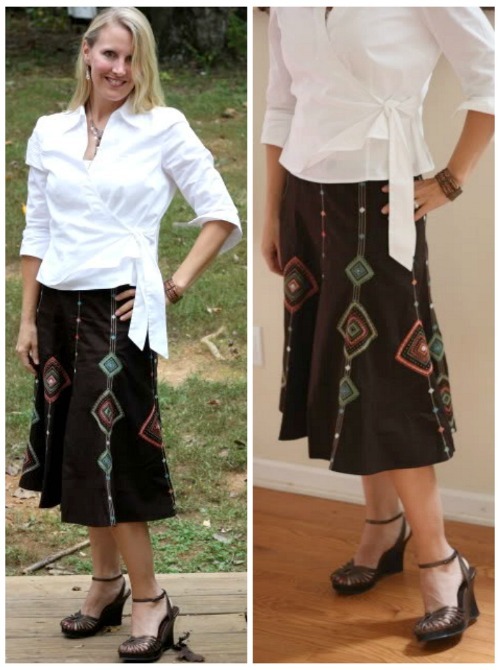 I am seriously envying that skirt–what a great find! And holy moley, it looks awesome on you! How fun! I had no idea that you do this! I love to bargain shop. And I have to say that those shoes are AWESOME – I am lusting after them! I think you are the cutest momma I know. That outfit makes me smile… it’s dreamy. For my 14 yr old- 2 pr dress slacks, 3 cute dressy jackets, 3 dressy tanks, turtleneck sweater, blouse, and 2 pr jeans. Plus a pair of jeans for one of my boys. The jackets for my 14 yr old alone would have been more than that retail! All name brand stuff…all the jackets were Ann Taylor Loft. Needless to say, I was a very happy mommy!! WOW – you had an amazing day. So fun to hear all the kids getting such great things. Isn’t it wonderful to have children/teens that are completely fine with GW? I HIT THE JACKPOT after I wrote this post with a black leather jacket. Can’t wait to show you all. Love love love the shoes! They are gorgeous! I love, love, LOVE this series :). I recently got hired as a photographer and the “uniform” required is black. I’m a springy type of person who adores pastels and lots of pink… so I had pretty much zero by way of black in my wardrobe. I have spent $15 and have name brand–some even still brand new–attire to dress up for work. I still need another pair of pants and something comfortable for shoes… But I feel pretty good about the pennies I’ve pinched ;). I forgot to add to my other comment above… I was totally planning on participating this round… and, well. I dawdled. Me again. With a question. Do you know anyone in Canada that has gotten amazing steals on stuff at yard sales/thrift stores? That is where I am originally from and I have never seen stuff like I find down here at yard sales up there – but I left there 5 yrs ago when I was 19 (and not a devoted yard sale/thrift store junkee) I get a lot of comments from friends and family members (in Canada) saying they could never find the same type of deals up there… and I am almost inclined to agree with them! Just wondering if you know of any great frugal shoppers up north! What a cute outfit! Thanks for the inspiration. Love this outfit, but then I love just about every outfit you put together. I especially like the skirt in this one. You are my inspiration. When I get in a clothes slump, I check out your website. I love your frugal ways!! It inspires me to hit the thrift store once more to see what I can find. (Frankly, it’s about all I can afford anyway.) You always look like a million dollars! girl, you’d look good in a brown paper bag!!!! You always find great outfits for super cheap! I just found a great peasant dress and Lucky Brand Jean Jacket…at goodwill! How cute are you!?! Love, love, love the shoes. FYI, I am fully hooked on couponing. Have been doing it religiously since your workshop, saving hundreds every month, and have enough laundry detergent for 8 months. Thank you, thank you for the inspiration and know-how! Just want to say that, even though I’m a size 1x/2x, I still find lots of clothes @ the thrift stores. My favorite is a Travelsmith basic black dress — size 1x — for a cost of $1.50. And my London Fog print trenchcoat — for $8. And for the kids! Today we went thrifting, and, despite the $12 dress that DD#2 insisted she needed for her speech competition, we came in under budget. Unfortunately, I don’t have the knack of putting a jazzy outfit together. Maybe if I keep reading …. You really have a special talent! You know how to spot pieces and then how to put them together for a great look.